Taking part in Tuscan cookery lessons and a Tuscan dinner. Our Tuscan cookery lessons consist of the cooking class itself and the dinner at which you savour the products of your labours. "Let's Cook" Tuscan cooking lessons can be fine-tuned for all levels of experience among the participants. Our aim is to show that greast-tasting Tuscan food is not difficult to prepare. Our participants have been single families, groups of families on vacation together, groups of students and even some journalists. 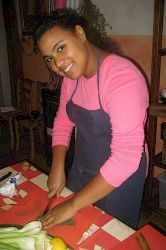 Professional cooks are also guaranteed to learn new and useful techniques and dishes. Jacopo and his wife Anna moved in the countryside fifteen years ago, looking for a human-scale lifestyle and a better place to raise their children. 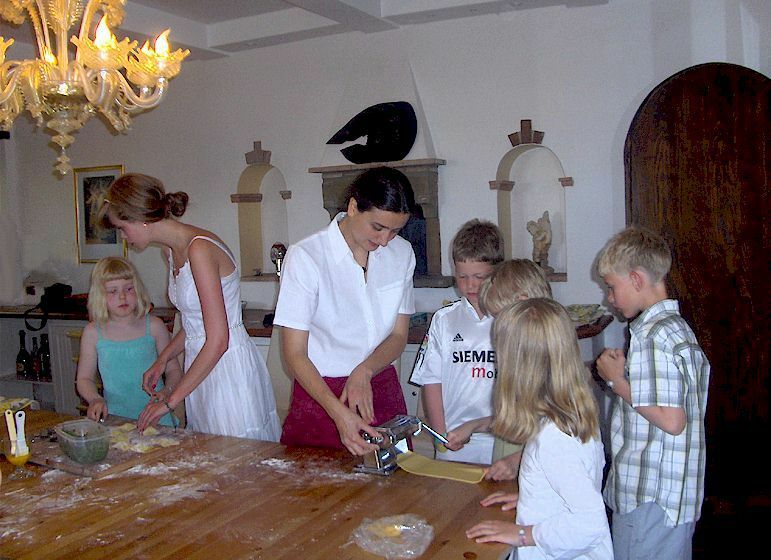 The countyside cooking classes are held in their attractive old Tuscan farmhouse, a true family home, where a professional and well-equipped kitchen has been organised. 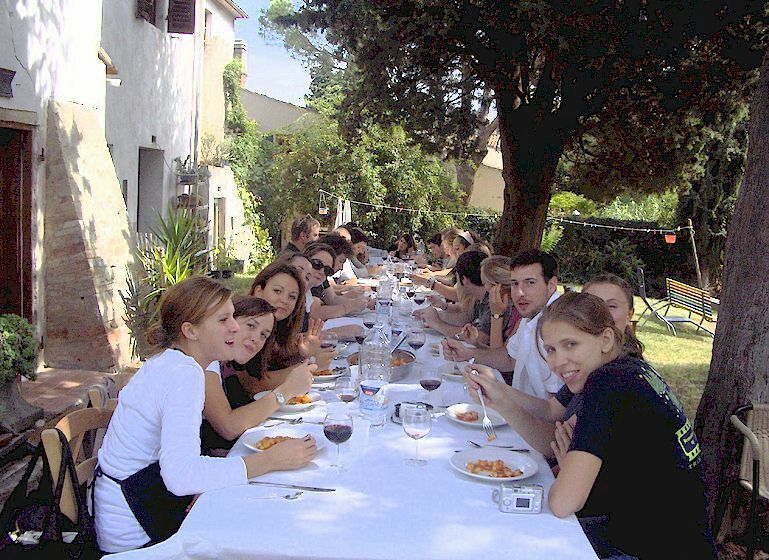 Following the lesson, we will enjoy the dishes you have prepared, taking time to relax, eat, talk, try some Chianti wine, in our peaceful garden. In wintertime, we can eat indoors in front of the fire. By taking cooking classes during your stay in Florence, you can merge art with food if you take the opportunity to become familiar with a few Florentine culinary traditions. Classes are held in a beautiful apartment in an historic palace in the centre of Florence. The kitchen is large and well equipped, well-lit. Before the class it is possible to go with Jacopo to shop for fresh ingredients at the local fresh food market San Ambrogio. This is one important way to experience the atmosphere of Florentine daily life and to meet the small farmers who still produce food in the country around town and come every day to sell their produce at the market. Mary Miller from New York, Fall 2005. Professor Peter Fischer’s History and Culture of Food class. Burn, studying Nutritional Sciences at the University of Connecticut . Syracuse University in Tuscany cooking class taught by Jacopo. Young but enthusiastic pupils preparing pasta in Florence. Enjoying the products of our labour at our house in Trecento.